The caption on the cover is, “Great courtesans of the 20th century,” which should give you an idea of what type of book this is. Darwin Porter writes tomes, big ones, hundreds of pages long. I’ve read one other book of his, Hollywood’s Silent Closet: a Novel, and this book is as big as the one on the Gabors. Porter primarily centers on Zsa Zsa, but covers all three Gabor sisters and their mother, Jolie. All three sisters took chances with the men they were allowing to woo them. All three were raped at one point in their lives, Magda by Adolf Eichmann, the Nazi in control of Budapest, even though she was married to the Portuguese attaché at the time. This is a tell-all book about who slept with who, who was lying about their bedroom partners in their autobiographies, who was passed between the sisters, and who got away. The information about their movies and their interactions with the stars at the time is gossipy, but nonetheless entertaining. Porter primarily spends most of the time in the 40s, 50s, and 60s, when the Gabors were young and vibrant. 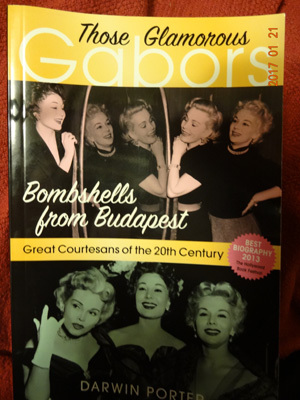 It is interesting to read about the competitiveness of the Gabor sisters, particularly Zsa Zsa and Eva. What does emerge is how these sisters were shaped by the desires of their mother, who wanted them to make rich marriages. Zsa Zsa was married more times (9) than her two sisters (Eva, 5; Magda, 6). At the time the book was written (2013), Zsa Zsa was still alive, and Porter dedicated the book to her. Like I said, it’s a big book at 752 pages (including the index). If you were a Gabor watcher or if you like the gossip of old Hollywood, you might want to read this book.